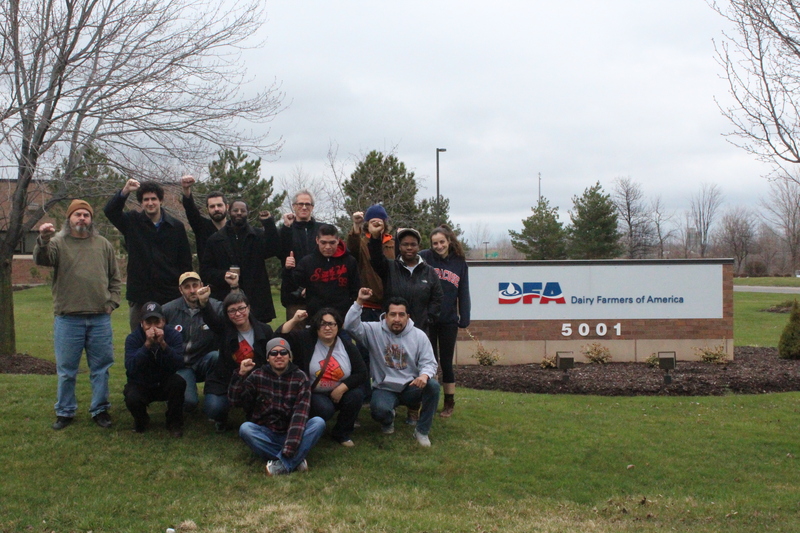 Today, Friday March 25, during National Farmworkers Awareness Week, a group of Workers’ Center farmworker members along with some of our allies , delivered a letter to the local regional office of Dairy Farmers of America (DFA), a national milk marketing cooperative. The letter was delivered to DFA’s office manager at 2:00 p.m. The letter requested a meeting with vice president Brad Keating and urged DFA to push Marks Farm, a local dairy farm and member of DFA, to stop retaliating against and restricting the rights of farmworkers. The WCCNY expects a response from DFA within the next week. This past December, the WCCNY organized a “Rally for Dignity and Respect” and delivered a petition with over 1200 signatures to demand that Marks Farm commits, in writing, to stop verbally and physically abusing workers, to respect the right of farm workers to receive visitors in their homes as stated by the New York Department of Labor, and to stop retaliating against workers who are trying to improve working conditions on the farm. Marks Farm has yet to comply with these demands. The Northeast Region of the DFA (of which Marks Farm is apart) produces 8.2 billion pounds of milk each year, more than any other region in the cooperative. We believe that if DFA openly calls on Marks Farm to treat workers with dignity, it would send a clear message to the rest of the dairy industry and the farming community as whole, that abusing and retaliating against farmworkers is absolutely unacceptable.